Ever want to make a Schoolhouse block? 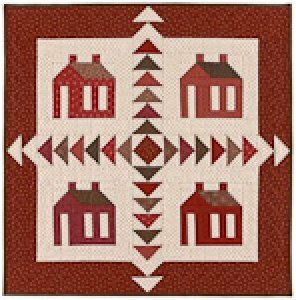 This is the quilt for you as it features a very easy-to-piece Schoolhouse block with NO "Y" seams! The Flying Geese sashing creates a lovely separation, and really showcase the Schoolhouse blocks. Choose two of your favorite colors with one background and you're on your way! Quilt measures 27" x 27".